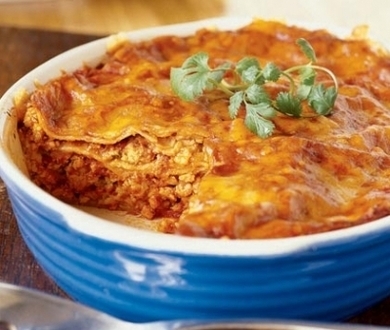 This si a medium spicy but seriously spicy Mexican chicken enchilada casserole recipe. I hope you enjoy it as it is one of our favorite recipes at the office. Cut the chicken up into small pieces, discard the bones. Pour the enchilada sauce into a bowl and add the chopped chicken and onion. Find a nice large casserole dish and line the bottom with tin foil. Pour the green chilli sauce over the bottom of the page and then add a single layer of corn tortillas over that and then add some grated cheese over that. Sprinkle with salt and pepper. Next add a layer of chicken and enchillada sauce and then another layer of cheese. This process needs to eb completed in this order untill all of the ingredients have been used up. Put the dish in a preheated oven at about 180 for 50 - 60 minutes. Voilla! As simple as that!